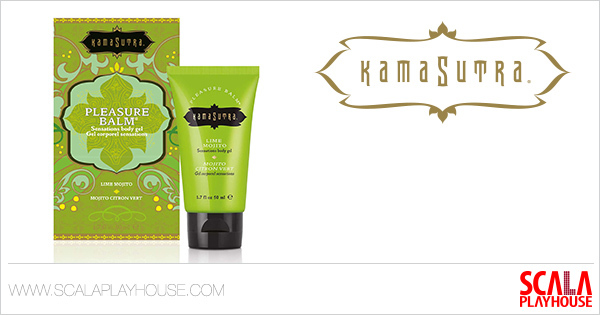 Pleasure Balm Lime Mojito by Kama Sutra is now available at Scala Playhouse. This kissable gel is a good choice for intimate foreplay. The Pleasure Balm Lime Mojito is one of the products from the Kama Sutra assortment at Scala Playhouse. The brand has a whole range of products to seduce your customers senses. This kissable gel contains a formula, which causes a tingling sensation when applied to the skin, plus a fresh taste on your customers lips. This flavor has a taste of lime, blended with cool mint. The taste Pleasure Balm collection by Kama Sutra offers some more flavors than just Lime Mojito: Crème de Mente, Strawberry, Raspberry and Spearmint. Besides Pleasure Balms, the brand also has a selection of other foreplay enticing items such as Oils of Love, which leave the skin warmed and fragranced and a selection of massage oils and lotions, each with its own unique scent. Retailers can learn more about Kama Sutra, and its products, at the upcoming ‘Welcome to the Future’ Scala Fair on the 4th and 5th of September as its brand representatives are present to answer questions.